Elizabeth Dowling Taylor received her Ph.D. from the University of California at Berkeley. Over a 22-year career in museum education and historical research, she was Director of Interpretation at Thomas Jefferson’s Monticello and Director of Education at James Madison’s Montpelier. Most recently a Fellow at the Virginia Foundation for the Humanities, Taylor is now an independent scholar and lecturer. She lives in Barboursville, Virginia. Annette Gordon-Reed, historian and legal scholar, has a triple appointment at Harvard University, where she is Professor at the History Department, Law School, and Radcliffe Institute for Advanced Study. In 2009 she won the Pulitzer Prize in history for her book, The Hemingses of Monticello: An American Family. The President’s slave, he came of age in the White House, and helped save the iconic portrait of George Washington from British torches during the War of 1812. Fiercely intelligent and exposed to rarified levels of ideas and power, he absorbed lessons meant for those of high stature. The constant servant in James Madison’s study, he learned by listening in at the feet of the master--the foremost political philosopher of the day—the theoretical underpinnings that supported his innate yearning for liberty. This is the powerful story of Paul Jennings and his one-of-a-kind journey from slavery to freedom. It is the story of his complex relationships with President Madison and with the widowed Dolley Madison who broke her promise to free him, and of the role of Senator Daniel Webster who lent him his purchase price. Born enslaved on Madison’s Virginia plantation in 1799, Paul Jennings died three-quarters of a century later, bequeathing valuable property in Washington DC to two sons. After achieving his own freedom, he endangered it trying to free others in the greatest-scale-ever attempted slave escape. He established himself with a government job and his family with a home in a vibrant antebellum Washing-ton neighborhood that included other families of ex-slaves of Presidents Washington, Jefferson, and Madison. He authored the first White House memoir, A Colored Man’s Reminiscences of James Madison. In a skillfully-crafted narrative, Elizabeth Dowling Taylor presents Jennings’s own story for the first time. She draws provocative portraits of African-American life at the Madison plantation and in early Washington. Through Jennings’s struggles, she explores the relentless challenges of being black in 19th-century America. Taylor also offers bold new perspectives on the characters of James Madison, Dolley Madison, and Daniel Webster by focusing on their private relationships with a courageous man of color who was “enamoured with freedom” and determined to rise. 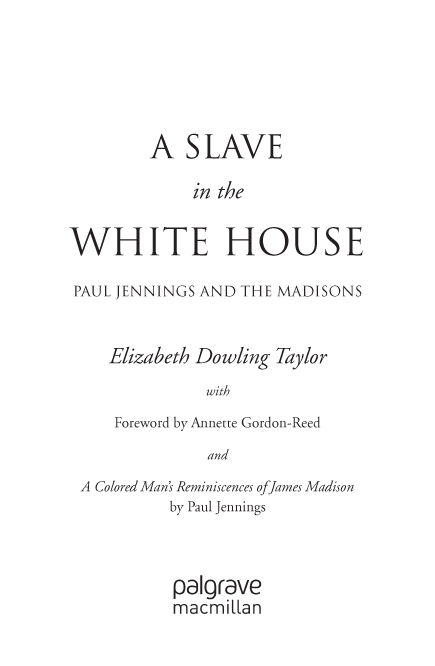 As the title, A Colored Man’s Reminiscences of James Madison implies, Paul Jennings’s memoir concentrates not on the author and his life but, typical for the time, on the “Great Man.” Certainly, one of the reasons Jennings matters is because of his association with James and Dolley Madison. 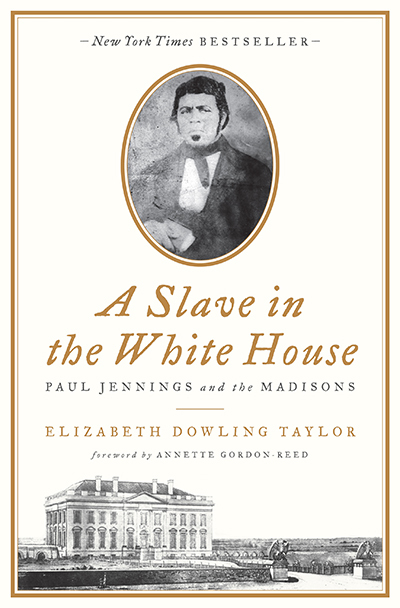 What counts, however, are not insider anecdotes about newsmakers with whom Jennings interacted as a servant, but rather what his sustained contact with these history-making personages might have taught him, and also what is revealed about the character of the Madisons when the focus is their relationship with a given household slave. Wishing that Jennings had included more of his personal story in the Reminiscences, I began to research it myself. I located a variety of primary sources that allowed me to piece together Jennings’s own biography, uncovered the circumstances behind the original publication of the Reminiscences, and made contact with living descendants of three of Jennings’s children who shared their family histories. It is a striking contradiction that Founding Fathers George Washington, Thomas Jefferson, and James Madison were slave owners, even during their service as Presidents of a new republic devoted to upholding individual liberties. Mount Vernon, Monticello, and Montpelier were lorded over by the general who won the War for Independence, the author of the Declaration of Independence, and the architect of the Constitution and Bill of Rights, respectively. As slave holders these men were not remarkable. Slave life at their Presidential plantations was typical for the time and place. On the other hand, there was a lot about Paul Jennings’s particular experience that was exceptional because of his association with James Madison, though it might have been inconsequential without Jennings’s intellectual ability and emotional grounding. Far too often in the past, the history of slavery and the stories of African Americans have been ignored, marginalized, or misrepresented. Slaves were not nameless, faceless groups of sullen or, alternatively, nonsensically happy people walking to the fields or big house each morning and back to their cabins at night with no real sphere of action or imagination. One key to appreciating our true African-American heritage is to examine personal journeys. Slaves were individuals with their own unique traits, talents, responses, and desires; they were members of families and households. They tried like all people, whatever their circumstances, to infuse meaning and gratification into their lives. When slaves were queried by whites, there were candor issues. The Montpelier slaves seemed “happy and contented” to the visitor who reported, “They will tell you that Mr. Madison was the best man they ever saw, and speak to you of Mrs. M. as one of the kindest and most excellent of mistresses.” The search for historical truth is a complex and tentative exploration, and those in power tend to control the prevailing interpretation. The process of correcting the American Master Narrative is ongoing. Those researching African-American history need to consider how writers before them used or privileged certain sources while giving others short shrift or discrediting them altogether. There was a time when slave narratives had to be “certified” by “upstanding” whites to be considered legitimate, though never a vetting process for the testimony of slave owners. Even today some consider any product from an abolitionist’s pen suspect, or caution against modern or revisionist interpretations. To tease out answers and insights concerning Jennings’s family, associates, experiences, and challenges I consulted a wide variety of sources. In addition to seeking primary documents from courthouses and archives, I scrutinized period publications (including so-called abolitionist newspapers) and sought out diaries and narratives of African Americans contemporary with Jennings, even as I studied the canon of letters and memoirs from the Madisons and their associates. As I worked up the Jennings family genealogy, I attempted to identify and contact living descendants. Of the three children mentioned in Paul Jennings’s will, I had leads to reach descendants of daughter Frances and son John, but none for son Franklin. Finally solving Franklin’s line to the living generations led me to the keeper of the Jennings family oral history, Paul Jennings’s great granddaughter, Sylvia Jennings Alexander. Mrs. Alexander lived with her daughter Mary in a spacious house in the Virginia countryside. I drove there for the first time on a Sunday afternoon in June of 2008. Mary, with whom I had set up my date, answered the door, then left me in the living room while she went for her mother. Before she did, she pointed out Paul Jennings’s daguerreotype on the wall. I was thrilled by it. I always assumed that should I be lucky enough to find a photograph of Jennings it would portray him in old age: I would look into the face but not really be able to sense the vital man. But here he was in his prime, fierce light-colored eyes, handsome and a bit formidable, and revealing at once his mixed ethnic heritage. Mrs. Alexander came in using a walker, and she and Mary sat together on a couch with their ancestor’s likeness behind them. Mrs. Alexander had blue eyes, and skin that was notably smooth given her 93 years. She was definitely on top of her game when it came to recalling family history, and a gifted storyteller. She would take on the speaking voice of “Grandpa Frank” in telling certain tales. Her stories went right back to Paul Jennings’s time. She was steeped in the family traditions, having spent many of her growing up years in the home of her grandfather who lived to be 90. To interview a slave descendant in 2008 who can contribute historical content that goes “back to slavery days” is definitely exceptional. Sylvia Jennings Alexander has been a rich source of knowledge in my quest to learn about Paul Jennings. I have a great appreciation for oral history. Is it always accurate? Of course not (nor are written sources). As researchers, we listen, we respect, we include, then we go on with the investigation. The liabilities are worth the benefits. This kind of intelligence is unique; there is no equivalent in the “records,” especially with African-American history, suppressed as it was. Mrs. Alexander’s description of how Paul Jennings acquired the skills to read and write meshed perfectly with what I had been discovering about him in other ways. I asked her how her grandfather referred to his father, and she answered “Pap.” Ah! That helped confirm the legitimacy of a source, problematic because written as a dramatization, where Jennings was referred to as Pap. You don’t find that in the archives. I returned to the Alexander home many times. I became familiar with all the family photographs on the walls; the heavy family bible was taken down from a high shelf for my inspection; I was shown Franklin Jennings’s Civil War swords. I shared what I had discovered about Paul Jennings with his descendants. One of them informed me that her 20-something son claimed that learning about his ancestor through my research was “a life-changing experience—I did not know black people did things like that then.” Every school child knows about the accomplishments of James Madison, but the story of Paul Jennings’s deliberate and courageous pursuit of that most-American of promises, the right to rise, offers fresh perspectives and sensibilities to all Americans. The author, Beth Taylor, with Sylvia Jennings Alexander, February 2009.